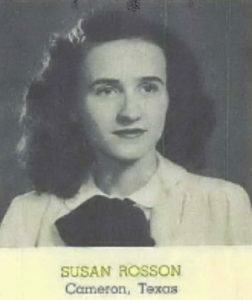 Susan Rosson’s photo from the Southwestern University Yearbook when she was in college. I’ve been doing research on the Gillis house, finding out who used to own it, etc. 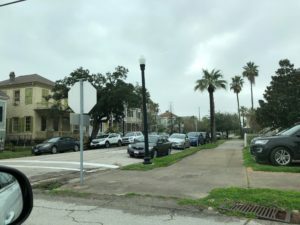 I hit a dead end, and even with going to the City offices and looking for the records, I still couldn’t figure out who owned it before the Taylor family. So, you can imagine how excited I was when one of my friends who’s a long-time Cameron resident said she knew who used to live there. She said the mayor would know more, even. So, I chatted with Mayor Anderle, and she said, oh yes, the Rosson family lived behind the First Christian Church (AKA The Hermit Haus). Off I went to investigate those folks! 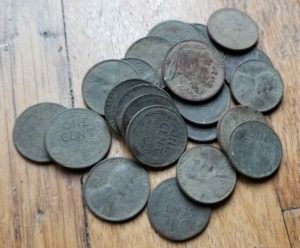 I devled into old Cameron newspapers, checked Ancestry.com, and did all my limited sleuthing abilities. My buddy the label maker. It’s Sunday, so let’s take a break from the hard-hitting reporting we usually share (what? really?) for something fun. We have plenty of great stuff about our projects, and even about former projects for next week, but first, I want to talk about label makers. That’s right. I think the label maker is one of the world’s best inventions. I have one for home and one for work. 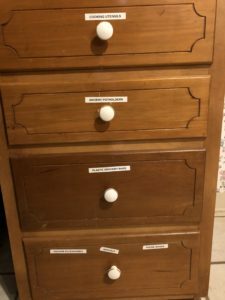 I realized I had not broken out the work label maker yet, which means I was always opening every single cabinet at the Hermits’ Rest Enterprises office to find stuff in the kitchen. 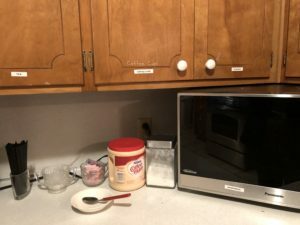 So, I took a break from blogging and technical writing, and reorganized the kitchen (yes, I know it’s getting demolished soon, but not THAT soon). Mandi came by to “help,” but she’s been really, really sick, so I made her just sit there and make labels. Maybe that was a mistake, since she labeled things exactly what I told her to. And she labeled the stove as well as the space where the refrigerator WOULD be, except we can’t get it downstairs. We also washed all the dishes and glassware we found, so now we can eat and be good to the environment (on the other hand, the church left what looks like a lifetime supply of styrofoam plates that I guess we can use eventually). We did discover the extremely loud dishwasher’s heating element is not in great shape, so we’ll be air drying from now on. The dishwasher’s manual, which I found while reorganizing, stated that it was bought in 1991, so it’s led a fine life for an appliance. If we only had a punch bowl we could feed a LOT of people punch. I’ve already used the labels and happily found a plastic bag to re-use and then recycle. I am satisfied. Next, I’ll label all the light switches like I did in my house, even though I KNOW the first thing we are doing on this place is re-wiring. All hail the label maker. All hail the ancient potholders (that’s the second drawer in the top left photo). Ahh, I can find stuff. It just makes me happy, OK? 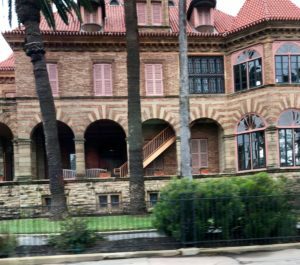 Lee and I made a very quick trip to Galveston Island, Texas over the weekend (hence, no blog posts). For once the travel was not about real estate investing, so there’s nothing to report about purchases or learnings. But hey, wherever we go, we can’t help but draw inspiration from the architecture. Galveston did not disappoint. In fact, I got lots and lots of ideas for color schemes and exterior touches for The Hermit Haus and the Gillis House. Lee says he’s been in this one. I guess when you are on an island and surrounded by beaches, it’s required to have many pastel colors in homes. From the oldest row houses to the newest beach houses on very high stilts, there was every pastel color you can imagine. There were some purple ones and aqua ones with intresting accent colors that really appealed to me, though those aren’t my usual favorites. There in Galveston, they looked fantastic. Of course, there are all the grande olde houses on Broadway (I guess hurricanes don’t blow them down as much as they do places on the beach). 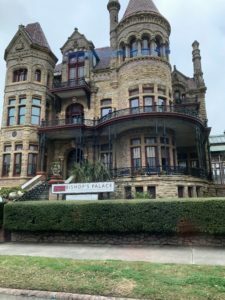 There were some creative rock and wrought iron accents that I know would fit in great with my vintage bed-and-breakfast dreams. I didn’t get to go inside many buildings (I spent most of the time walking through very wet wetlands looking at birds). However, the restaurant we ate lunch in provided me with enough ideas that I got quite distracted from the best gumbo and shrimp and grits I ever tasted. The wood ceiling was exactly like I hope the Gillis house will turn out, and there some interesting but not crazy light fixtures I’d like to find a source for. And even the ceiling beams were inspirational. They had carving or inlay or veneer or something that had a lovely, but subtle design. The ceiling at Miller’s. 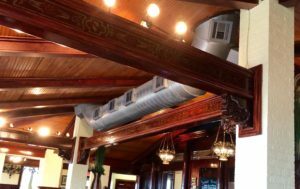 The air conditioning duct is just part of the decor! We will probably have beams that show up in the fellowship hall at the Hermit Haus. Maybe they can be an equally decorative feature. Back at home, we’ll soon have news on the Washington House progress. We had a good open house at Parkwood this weekend, but no more offers. Other agents tell Carol it is priced well. They worry that the houses on either side are turning people off. So, we will see if we can get the dead car out of the yard on one side, and may offer to spruce up the other house next door’s exterior. They have had way too much going on in their lives to do that stuff. Look at all those different bricks.